2006 Archmere graduate Victoria Sowa Gordon serves as chair of the Order of Malta's "Lourdes in a Day". 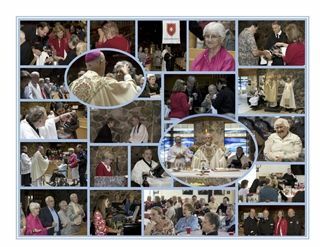 The Order of Malta is a 900-year old, Lay, Religious Order of the Roman Catholic Church, serving worldwide and in the greater Philadelphia area, whose mission is to care for the sick and poor and to defend the Catholic faith. 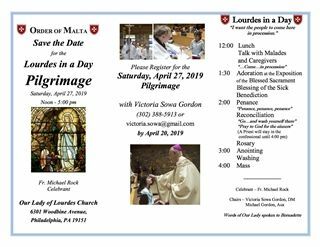 Victoria is helping to organize their "Lourdes in a Day" Pilgrimage on Saturday, April 27th from Noon-5:00 pm at Our Lady of Lourdes Parish in Philadelphia, PA. The Order will be hosting malades (the French word for individuals suffering from any illnesses) and their caregivers to receive the graces and healing of "Lourdes in a Day", which includes includes lunch, adoration, blessing of the sick, Benediction, Penance and Reconciliation, a rosary, anointing of the sick, washing with Lourdes water, and Saturday Vigil Mass.